My name is Kris. I did not grow up in a church. As an adult, I believed that I was a strong woman and I could take care of everyone and everything. Who needed a church? I had me. I was a good person. That surely was my key to heaven. Then came the year 2010. I rang in the New Year unemployed, having been part of a corporate layoff while I was on maternity leave following the birth of our daughter, Emma, the previous March. In January my husband, Seth, and I learned that the spinal cord lipoma she had been born with would require a significant surgery. Just after Emma’s first birthday in March she had surgery to untether her spinal cord to prevent nerve damage, allowing her to grow normally. I became consumed with her recovery and concerns of her future health. In June, things were beginning to look up. Emma was healing beautifully and I was working as a temp at the company where I previously worked. Then I received the call. On June 25, just after lunch, I was overhead paged to pick up a call. My sister was on the other end of the line letting me know that our father had a heart attack while attending a car show with our six-year-old son, Logan. She urged me to get to the hospital as quickly as possible. Over the course of the two-hour trip from work to the hospital, the calls with my mom and sister progressed from, “It’s pretty bad,” to ultimately learning that he had passed away before I could get there. I didn’t get to say goodbye. The last time I saw him alive was that morning when I hugged him after dropping our children off so I could go to work. I should have hugged a little longer that morning and told him I loved him again. I was crushed. I was worried about Logan and what he had experienced. I was terrified of being strong enough to continue on without Dad. Our family held each other up, supporting each other while we set out, limping together into our new life without one of the people we loved so dearly. I started back to work on Tuesday, July 6, just one week after Dad’s funeral. At 10:00 that morning, for the second time in a week-and-a-half, I was overhead paged to pick up a call that would deliver devastating news. A representative of the lumber company where my husband worked called to inform me that Seth had been impaled by a large piece of wood when the saw he was operating jammed and then kicked the piece backwards into him. I vaguely remember hearing the phrases “a lot of blood loss,” “Life Flight,” and “get to the hospital quickly.” I asked if Seth was still alive and was told that they weren’t sure. A co-worker drove me to the hospital and as I stood at the emergency room desk, I heard the helicopter carrying Seth land over us. I was quickly whisked to a small private family room where I was met by a volunteer chaplain and then escorted to the trauma bay. I was able kiss Seth and tell him I loved him as they kept him stable while an operating room was opened for surgery. They would remove some of his damaged organs and repair torn muscles. Over the next three weeks, he was moved through three levels of intensive care, then to a regular room, and ultimately home to continue his recovery. In the coming months I would exhaust myself taking care of Seth, our children, and supporting my mom, while I tried to work enough hours to be kept on as a temporary employee. I was a shell of the strong woman that had started the year. I no longer had me. I began to feel that something was missing in our life—something more than Dad and the safety and security that we enjoyed pre-2010—but I wasn’t sure what. Seth, who had grown up in a church, asked me about attending church. For most of our nine-year marriage I had resisted, but now I agreed. In early March 2011 we attended a service at Good News Lutheran Brethren Church. My brother and his wife had attended there for years and my mom had recently started to attend. It was a very welcoming church and the services were easy to follow. I learned a lot, moving in my thinking from salvation for “good people” to “Jesus plus me.” I just couldn’t figure out what I was supposed to be adding. I remember reading that verse and things began to click. God loved me as the unworthy sinner that I was. Loved ME. So much, in fact, that he provided for my salvation in a way that I couldn’t interfere. Salvation isn’t “Jesus plus me.” It is Jesus. Looking back, I know that I needed to be at a point where I could no longer rely on myself in order to be receptive to hear, know, and believe the Good News. God used the absolute worst year in my life to prepare me. Knowing that God loved me even before I believed, I can now look through the pain to the many blessings of 2010 as God cared for us. Both Emma and Seth recovered with none of the setbacks or complications that were anticipated by their medical teams. My unemployment and Dad’s early retirement meant that after dropping Logan off for school, Emma and I were able to have breakfast with him every weekday morning for the six months before his passing. Most of all, God brought our little family to Good News Lutheran Brethren Church, a church that would not only care for me as I took my first steps as a Christian, but provided teachers for my children so that they, too, could learn about a true saving faith. 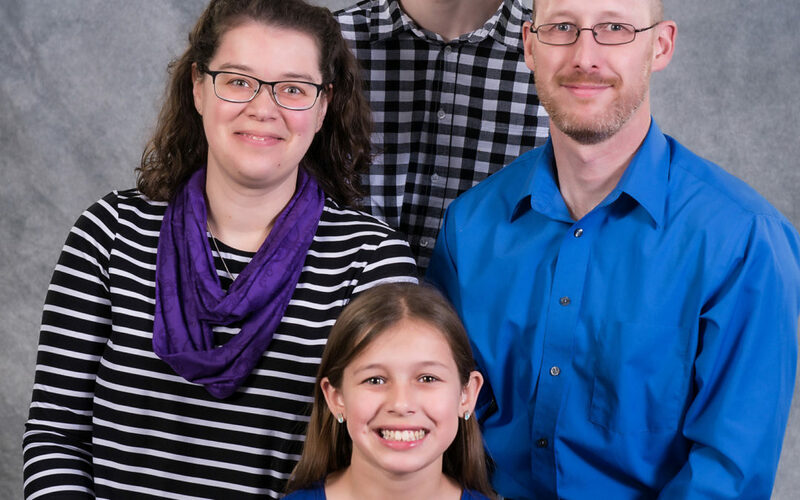 Kris and Seth Mattern are members of Good News Lutheran Brethren Church in McAlisterville, Pennsylvania. Kris serves as chairperson of the Worship and Music team, and works in human resources for a local hospital. Seth serves on the Trustee Board and works for the Pennsylvania state parks system.